The inability to perceive, or to see, colors: The doctor told Sam that his achromatic vision was a result of a severe congenital deficiency in color perception which might be associated with nystagmus (the involuntary rapid rhythmic movements of his eyeballs) and reduced visual acuity (loss of the ability to detect fine details or small distances with the eyes). The doctor also indicated that he has several other patients with similar abnormal achromatic visions. 1. An opinion, suggestion, or recommendation offered as a guide to action, conduct, etc. : William and Sharon decided to act on their father's advice and to get married. 2. An opinion about what could or should be done about a situation or problem; to give counsel: Since this is a legal matter, Mike was urged to get a lawyer’s advice before he got involved in the business deal. 4. Formal or official information about something; intelligence, news report: Advice from abroad indicates that war is about to begin. 5. Etymology: from Latin ad-, "to" + visum, past participle of videre, "to see". Advice is what you get from your parents when you are growing up, and from your children when you are growing old. It’s a pleasure to give advice, humiliating to need it, normal to ignore it. The quality of being able to be worthy of a recommendation; that which is sensible: Karen and Ted discussed with their real estate agent the advisability of buying a home so close to the airport. A reference to that which is proper or recommended to be done: Mindy's doctor told her it was advisable for her to lose weight as soon as possible. The state or quality of being a worthy recommendation and a desirable procedure. Wisely, in a prudent manner. 1. To offer an opinion or a course of action; to counsel; to notify, to recommend: Sidney advised Jon to reconsider his decision to sell his car. 2. To inform, tell, notify, make known, communicate: Mary and Richard have been advised that the roads are too icy for the trip that they were planning to take. 3. Giving an opinion or suggestion to someone about what should be done: Shirley advises the President on foreign affairs. Howard's lawyer is advising him about whether he should buy the house under such financial conditions. 4. Etymology: from Old French avis, "opinion"; which came from Old French ce m'est à vis, "it seems to me"; or from Vulgar (common) Latin mi est visum, "in my view"; and originally from Latin ad-, "to" + visum; past participle of videre, "to see". Being informed or made aware of with deliberation: The counselor gave the parents advised procedures for being patient when dealing with their children. Relating to doing something with careful consideration and thoughtfulness: Jeremiah was advisedly cautioned by his therapist to take time off from work so he can recover from his back injury. To consider something carefully: The press received a message from the congressman saying, "Thank you for your suggestion. We'll take the matter under advisement." © ALL rights are reserved. 1. Someone who gives professional recommendations: Harry was given professional suggestions by his company's financial adviser regarding any new investments. 2. Those who give guidance to students on academic matters; such as, course choices: Kristine was a school adviser who made suggestions that would help those in high school who wanted to prepare for studying in higher education. 1. A report that gives information or a warning about something: William heard a traffic advisory stating that heavy snow was expected tomorrow morning. 2. 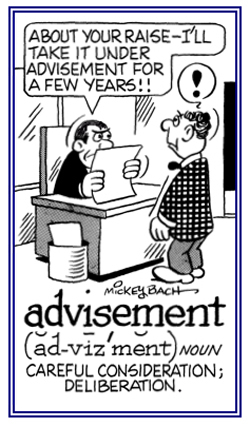 Etymology: formed from English advise, "counsel, recommend" + -ory, "relating to"; said to be an adaptation of Late Latin advisorius, from Late Latin advisor. Having the power or right to make suggestions about what should be done: George went to the meeting of the advisory panel to get some guidance as to how the new project can be successfully accomplished. Materials using sights and sounds to aid in presenting information: When Mr. Smith presented his lesson about biology, he utilized audiovisual materials which helped students to better understand the contents of the subject. A presentation that uses both film and sound recordings: Ed wanted to enhance his teaching with more audiovisuals that could provide greater interest in the lectures he was planning for his students.